The latest ONS data show the volume of GB construction output rising by close to 6% in 2017. With this rise industry output is 27% above that in 2012. Private housing and commercial building have been the principal growth drivers since 2012, although the outlook for these markets is one of change. Weak business confidence alongside frail consumer finances are affecting the commercial and residential property markets, which combined with ongoing public sector austerity suggests weaker construction volumes. 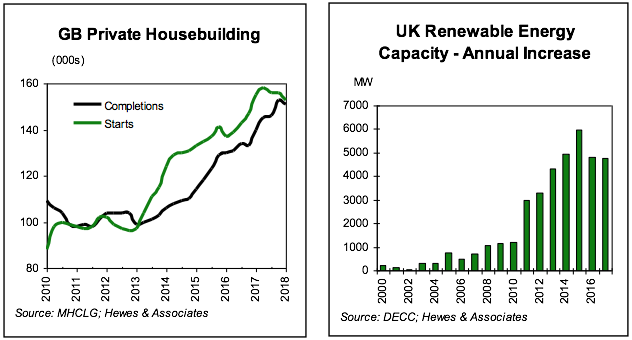 Private housing output has almost doubled since 2012, and this sector is now the largest GB construction market. Further growth in private housing relies upon continued house price growth, something that seems unlikely in our view, especially when viewing recent price data – Halifax data show prices as unchanged on those of autumn 2017. Meanwhile, a lack of affordability combined with weak wage growth suggests an ongoing reliance upon government assistance – that is assuming the absence of a sharp price correction. In the commercial new-build sector output volumes rose by 5.5% in 2017, while orders fell by 6%. Over the twelve months to April 2018 commercial orders fell by 13%. A weakening in the London office market partly explains this situation. Infrastructure construction is set to benefit from large projects such as HS2, although while the orders for this project have been awarded, work will not start until well into 2019. Public non-housing continues to suffer the effects of austerity-induced capital budget restrictions, a situation that looks set to last to 2020.